If you want to create a beautiful Seahorse aquarium, one of the best investments you can do is definitely to add some macroalgae. They will help to keep your aquarium water cleaner (by taking out nutrients like Nitrate and Phosphate), and at the same time, you will offer a great living experience for your seahorses as well. The thing to keep in mind is that macroalgae are perfect to be inconspicuous, so they don't need to be the centre stage, taking away the focus from your beautiful Seahorses, but as Seahorse love to hold onto a lot of macroalgae species, or using them as a feeding ground for copepods and rotifers you will surely enjoy the macroalgae as well very fast in your aquarium. Macroalgae offer you the benefits and value that you always wanted from something like this. They are the best natural holdfast, not to compare with artificial plastic ones, and you will have a very good time if you start using them in your aquarium as fast as possible. It’s by far a tremendous ROI, and that can pay off very well. Plus, macroalgae offer that natural visual appeal that you want to get from a seahorse aquarium. Sometimes you just need that extra touch that will make the entire marine aquarium come to life. The macroalgae are designed to offer you all of that, and the advantage of it in your tank is really special in the end. Why should you start using marine macroalgae as holdfast? The provide holdfast for Seahorses is very important for a Seahorse aquarium. Macroalgae will help you to provide a very distinct, natural look to the entire aquarium. It’s very hard to achieve such a look without the right holdfast. And that’s why you need to push the boundaries as much as you can from that perspective. Ideally, you want to opt for quality marine macroalgae to avoid any problems and to have a healthy growth. Can you use macroalgae on a low-nutrient system? Normally this will be a bit hard to do. Why? Because the macroalgae require quite a lot of nutrients ( eg. Nitrate and Phosphate ), and the more macroalgae you use, the harder it will be in a low-nutrient-system to obtain the results you want. It’s by far one of the better options in that perspective, to use slow to medium fast growing macroalgae species, as they will need fewer Nutrients to grow and therefore they will be the better choice for a low-nutrient-system, all you have to do is to make the right pick and see what option works well for you. If you have any questions about the selection don't hesitate to contact us. When you want to use macroalgae, you have to prepare for a system that offers enough nutrients. In the end, it’s good for your seahorses too, and it will just make your marine aquarium feel so much more alive. Granted, it will also be costlier, but it will end up bringing in a natural look, all while offering the perfect conditions for the seahorses and algae in it. Are macroalgae better than artificial holdfast? A lot of people end up using an artificial holdfast in their marine aquarium. Unfortunately, that’s not bringing you the look, nor the value that you want from your Seahorse aquarium. You do want your aquarium to stand out as much as possible, so using macroalgae will help quite a lot here. Marine macroalgae will help you get the natural holdfast look. They will help eliminate those cheap looking plastic rings or microalgae overgrown artificial plastic plants. You don’t want to ruin the look, you want to make it more interesting and appealing. And you can’t really do that with an artificial holdfast. Sure, it might still look ok, but you want to keep things natural, not artificial. There’s a line to follow when it comes to structure and value. It will work great for you as long as you make the right adjustments and focus on quality as much as you can. Are there other reasons why you should use macroalgae? Yes, there are plenty of benefits that come from using macroalgae in your marine aquarium. For example, they are the perfect hiding structure for copepods or rotifer. They don't need to be right in the middle of the aquarium, and you will get to handle everything a lot easier and in a meaningful way. In situations like these, you want to have a natural and appealing aquarium. This means removing all artificial stuff and using something that really brings that marine vibe. After all, seahorses are marine species. You want them to feel right at home, which means you have to adjust the water, nutrient levels, and other features. The great thing is that the rotifer and copepods will be able to grow a lot faster, without having seahorses near them. A lot of macroalgae species do a very good job providing shelter for copepods and Rotifers, which will increase the natural population of them. For a new system especially but as well for established Seahorse aquarium, we recommend buying some live Copepod and Rotifers after you added the macroalgae, to provide a better start for them in your aquarium It’s important to have a comprehensive ecosystem, and bringing in such an approach is extremely important. Having natural live food in your marine aquarium is not mandatory, but it just spruces up things and makes them more appealing and interesting. It’s the type of thing that can do wonders and most of the time it will work to your own advantage. Another thing you will like about macroalgae is that they are great at offering you a new perspective in this regard. It just makes it easier for you to adjust and figure out which is the right option in no time. Decorating your aquarium can always be a challenge, especially when you want to keep seahorses in it. But that’s why using macroalgae does make a lot of sense. It’s visually appealing, rewarding and at the same time, it’s just a great opportunity to spruce things up. But you still retain the natural look of your aquarium, all while offering an additional source of food to your seahorses. They also bring in more colour, form, and texture to the reef systems. Plus, you can use macroalgae in the refugium. That makes things a whole lot better and more rewarding in that regard, it all comes down to figuring out which is the better approach based on your needs. Yet macroalgae will work great in most situations here. It’s safe to say that having a marine aquarium does come with a lot of maintenance requirements. Most of the time the marine aquarium can have nitrate and phosphate accumulation. That can be extremely tricky to deal with. Thankfully, macroalgae can be used to easily keep the water quality at a very good level. While it often won’t completely remove phosphates and nitrates (depending on how many macroalgae you use), it does provide you with all the benefits and results you would expect. Is it necessary to have lots of light in your aquarium if you use macroalgae? Normally, macroalgae will thrive if you have plenty of light. A lot of species prefer the highly illuminated areas, as well as places with high levels of nutrients. That’s when the macroalgae will have the most efficiency, and they will start removing the nitrates and phosphates from your marine aquarium. Doing that is a very simple, yet efficient approach and one that can do wonders for you in no time. Important to know is that especially red macroalgae species will prefer a not too bright area of your tank, as they grow often slower as green macroalgae species. 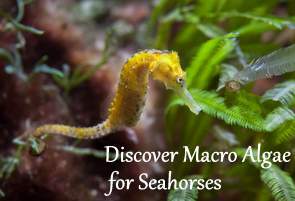 Macroalgae can also suppress the growth of bad algae (microalgae), all while promoting the creation of a healthy environment for your seahorses. 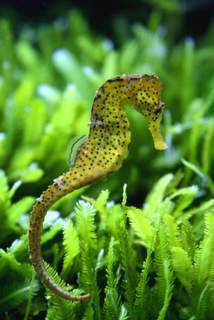 The bottom line is that macroalgae are very beneficial for a seahorse aquarium. You still need to play a little bit with the type of macroalgae you can use and the amount you can add to the aquarium. But for the most important part, creating a more natural environment for the Seahorses will be an amazing one, and you will have no problem to get the very best results this way. You can try out a variety of macroalgae for your seahorse aquarium, or you can ask us to determine the best option. One thing is certain, all macroalgae are amazing for your marine aquarium, and they offer tremendous benefits!